Another strange MZ family member. At the moment, we have no information about it. It seems to be a "super MZ 80B" (that�s what the badge says, anyway), but we are not sure it was compatible with it. To our knowledge, the MZ-2000 was never regularly exported outside Japan. 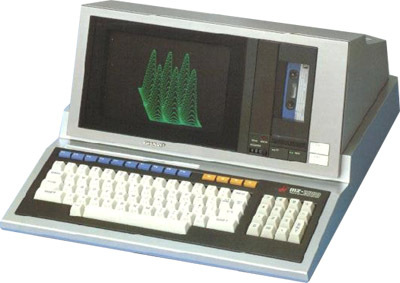 A "16 Bit Bord Kit" was sold in April 1983 to expand the 8-bit computer to a 16-bit system. Price: $327. Interesting about this model was that when it powered up, the user would have to wait some time for BASIC to load from a cassette tape into RAM. (I don't recall the version number) Loading was an automated process, which took 1 to 2 minutes. If there wasn't correct install tape in the cassette deck when it is powered on, the cassette player would open up asking for proper install tape. This was one of MZ-2000's unique features. (Personally I thought this action was robotic and cool, extremely advanced in technology at the time in my mind. Just to see the computer "ask" me to put the tape into the player, I used to keep the tape out on purpose every time I switched it on. My friends seemed to be impressed at the sight) And the power switch was in the back of the unit, which I think was typical of personal computers then. Of course, computers did not have internal hard disc drives back then, so whenever power is turned off the computer would lose all its data in memory. Anything which wasn't recorded into tape is gone at that point. see more Sharp MZ 2000 Ebay auctions !